Jack Nicklaus may have put his name to more than 300 courses worldwide, but only a tiny fraction of them have been located in Europe. Of the European courses created by the Nicklaus Design company, half have been in Britain and Ireland and half of the remainder in Spain. No great surprise then to discover there is only one Nicklaus signature design in all of Germany, here at Gut Lärchenhof Golf Club. For what it's worth, the Lakes Course at Schloss Lüdersburg is also a Nicklaus creation according to its owners, but they don't have a golden bear sculpture in front of the clubhouse. So in that sense the Golden Bear at Gut Lärchenhof is unique within Germany, although at one time it almost became a non-entity there as well. That was when the club's owners – a non-profit community bank – were questioned why their business model included running a loss-making golf course. When nasty allegations of misappropriation of savings deposits made the rounds, the golf operation was sold off to a wealthy member in 2009 and has been sailing in more peaceful waters ever since. The same cannot be said of the bank's former director, who was subsequently indicted for tax evasion on benefits received in the form of a complimentary membership. When the dust finally settled, Gut Lärchenhof returned to the professional circuit by staging the BMW International Open in 2012, 2014, 2016 and 2018, thus continuing a proud tradition that began by hosting the German Masters (1998 - 2005) and the Mercedes-Benz Championship (2007 - 2009). It is fitting that Bernhard Langer, who has won here no fewer than four times, promoted the tournament through his Langer Sport Marketing company until 2009. The course itself is a championship venue with typical American styling. When the European Tour comes to town they add brutal rough, but in everyday play the fairways are wide and largely devoid of challenges. Most holes are clearly arranged and the driver can be used with little fear. The greens aren't especially wild and the bunkering is quite predictable. All of this results in the unusual situation of a modern Tour venue being neither overly long nor particularly difficult from the members’ tees. If you front up here and discover that this type of expansive, stadium golf does not sit comfortably with you then you may find some culinary consolation in the Michelin-rated restaurant located within one of the very best clubhouses in Germany – guten Appetit! Gut Lärchenhof is one of the most expensive courses in Germany and thus immaculate conditioning and a splendid clubhouse can be expected. However, the super casual mentality of the Cologne crowd - compared to perennial and glitzier rival Düsseldorf - makes for a surprisingly relaxed atmosphere. In fact, I found it quite funny to contrast the professional business attitude of the staff with the unceremonious practicality of the members. Make no mistake, these are well-heeled folks, but in a sloppy kind of way. And you can be a bit sloppy on this course. There isn't much to induce anxiety, even the water carries can easily be circumnavigated, if you allow yourself an extra shot. 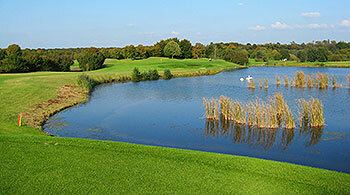 Take a look at the included picture of the most beautiful hole, the par 3 16th. The tiger can draw it over the bunkers using the backstop behind the green or go right at the pin with a straight shot hit high into the air. Even a running approach with a slight fade seems possible. But you can also make it as easy for yourself as you like by playing out to the left. The par 3s were definitely the highlights for me. While they are all quite long, they are more varied with respect to shot selection than on most layouts of this type. Unfortunately the rest of the course isn't quite as energised. Exciting short holes are missing. There are a number of moderately long par 4s, which just barely make the cut, and one excessive slog on each nine, which doesn't. The visuals are nice, but the design itself is too generic to crack anyone's list of anything. No good shot was ever punished here. A classic 'Jack Nicklaus' design. This is not a recommendation. This course is always in fantastic shape. A modern layout that provides a championship golf test in the truest sense! Who doesn't like to play a course that the pros try to tackle every year?